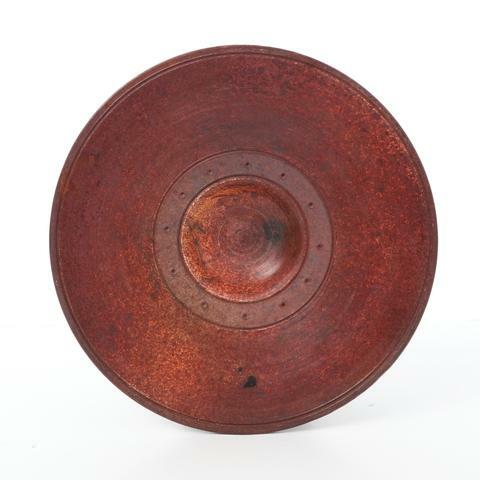 As its name would suggest, this beautiful platter displays rich tones of red and brown. It is elegant in its simplicity, with the refined details and earthy colors making this piece both ornamental and practical. Comes equipped with a simple wire hanger. This gorgeous platter is an example of his use of the raku technique, a centuries-old Japanese firing technique which, through unique finishing processes and artistic skill, produces individual works of art that are truly one of a kind. Each piece is signed and dated on the bottom by the artist. Piece measures approximately 10.5″ in diameter, and could serve as a functional platter or a stand-alone display piece.